Tucked away off 10th Avenue and 54th Street, behind a bizarre, jail-like facade, is a small, inauspicious shop which serves up surprisingly fresh and tasty sandwiches. It is an important oasis in the middle of Foodblivion. 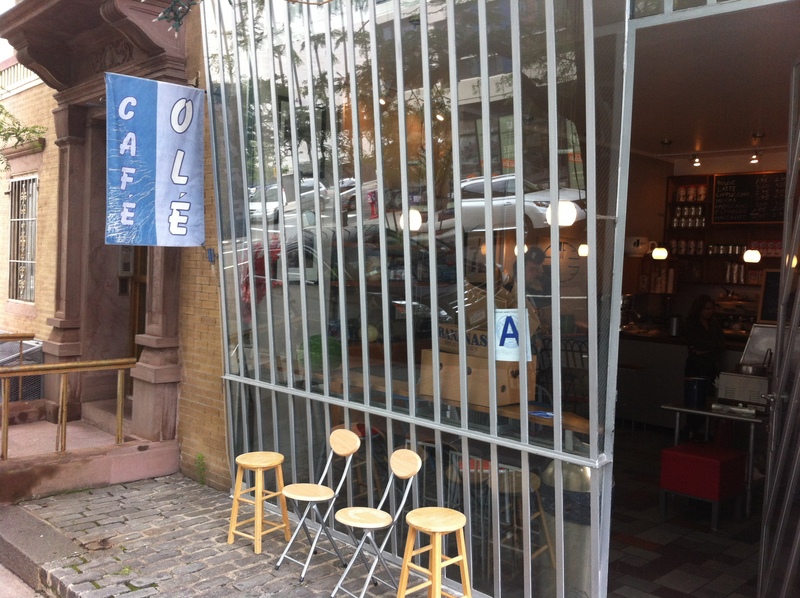 Part of the trouble with Cafe Ole – other than finding it – is that between the bars on the windows and what you can see looking through them, you wouldn’t be blamed for not knowing they sell sandwiches. The only thing you can see from the street is their coffee menu, so for quite a while I thought this was just a coffee shop. 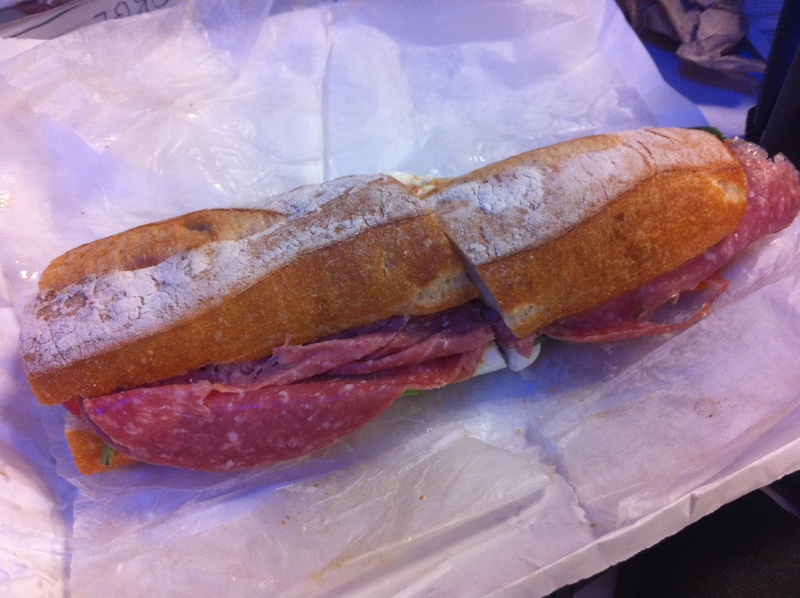 But people were leaving the shop with long, white paper bags that looked like they were filled with sandwich… . The shop isn’t particularly impressive either inside or outside, visually. There’s a very relaxed feel to the place, but frankly it looks a little… shady? Shabby? Like it’s trying to be a boutique-y shop, but can’t afford the trimmings. It’s hard to put into words. What is wonderful, however, is the relaxing and transportive Flamenco(?) music constantly playing. The folks behind the counter are very friendly. There are a few seats tucked into a corner and a small round table or two. Over on the right hand wall, out of the sight from the street, there is a food menu. 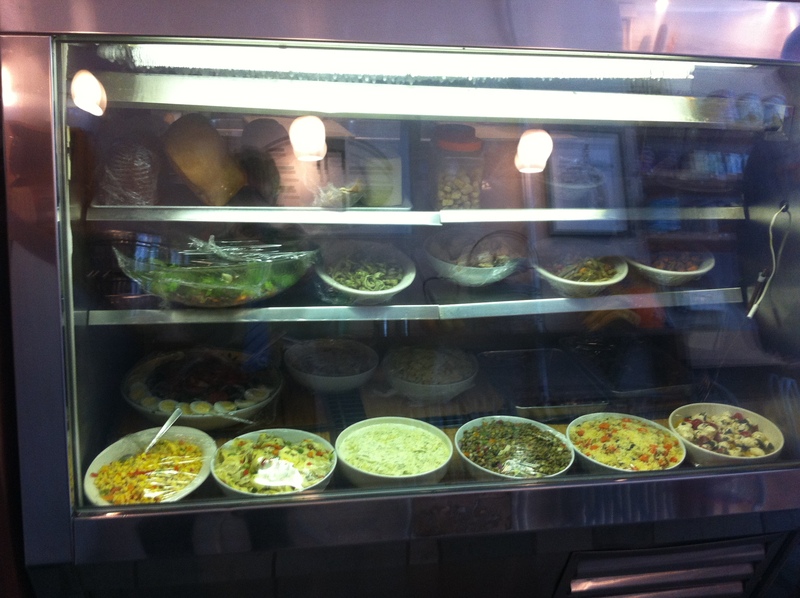 It sits above and behind the counter containing much of the prepared food. The salads contained therein seemed to have good ingredients, but I am always a bit nervous about those large stores of prepped food covered with cellophane. It looked good, but so far, more things about the shop were making my spider sense tingle negative rather than positive. I am glad to have been wrong about that. Doesn’t exactly look particularly promising, does it? Not bad, but… . 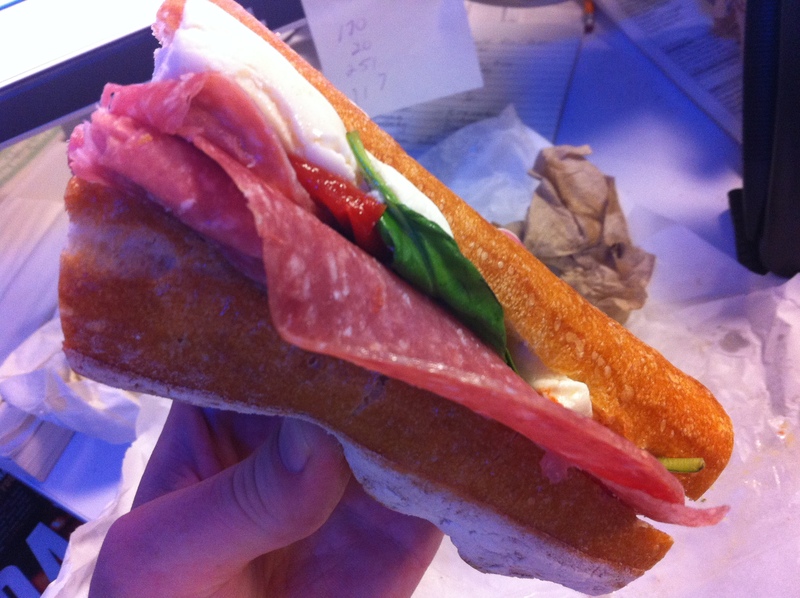 I opted for the salami and mozzerella sandwich. Watching it be prepared – the beautiful, fresh bread pulled from the box, the thick slice of fresh mozzerella, my attitude began changing, like the sun coming up or the tide coming in. Just look at that beautiful sandwich! Whoever is providing them their magnificent bread deserves a good measure of praise, as does Cafe Ole for choosing to go with them. That is beautiful, fresh bread. Good bread can make or kill a sandwich. This is great, crusty (but not brittle or hard) bread with a good bite and decent chew. The mozzerella was cut thick and fresh. The salami was delicious. 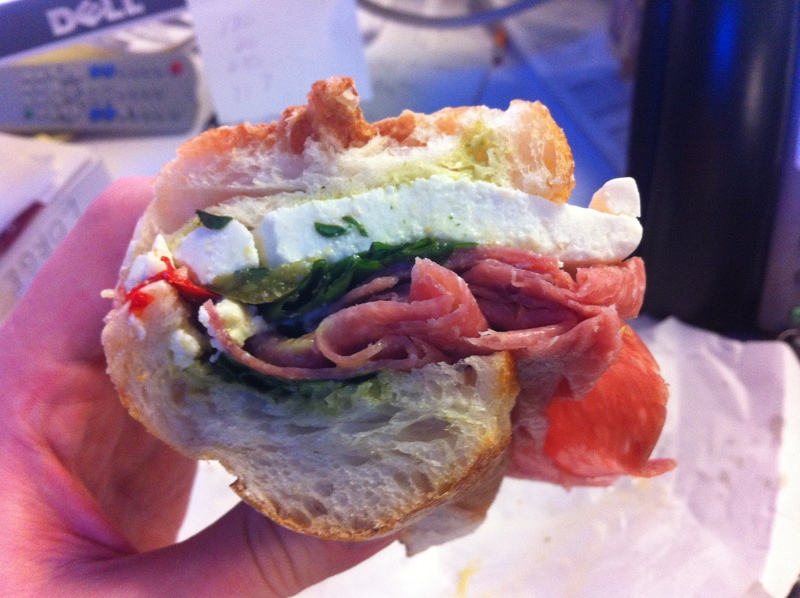 The sandwich was served with roasted peppers and fresh basil. It was a winner! So much so, I went back a day later and got it again. It clocked in, with tax, at around $8.61. 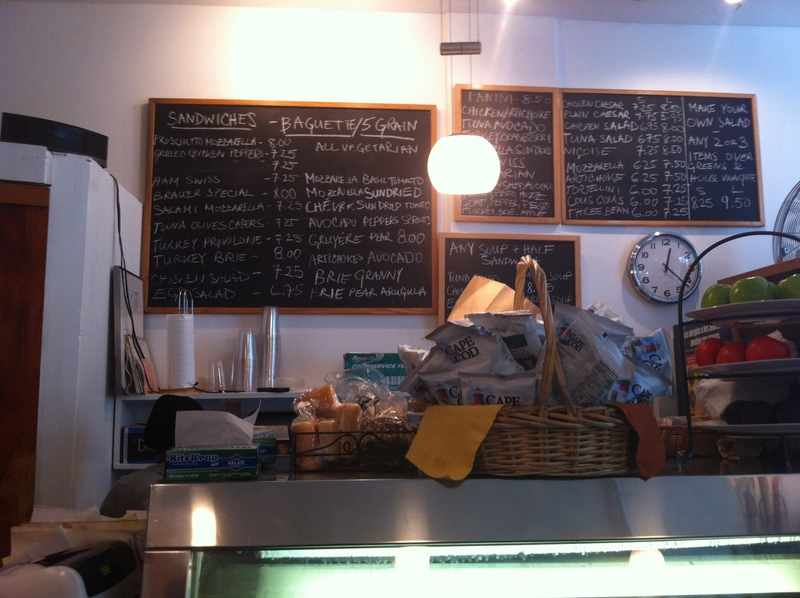 I’ve since also indulged in their turkey and brie sandwich, which was also fresh and delicious. They have a stack of vegetarian sandwiches as well – avocado this, sundried tomato that – and I am looking forward to working my way through their menu. In addition, considering the quality of their sandwiches, those prepped salads mentioned earlier are clearly worth a closer look and I will probably have to try some of them. Considering how starved for quality food the far West side is, Cafe Ole takes on additional importance. It is an unassuming, comfortable break offering a pleasant, tranquil vibe, nice music, and good food. I’ve come to really appreciate what it feels like to step in there in the middle of a day at the office. It’s relaxing. I’d rather get food from Cafe Ole than from the Lunch Box, which I had previously taken to be the only place around serving a fresh sandwich. Although that place is good, Cafe Ole is better. ← BREAKING NEWS: Prime Burger To Close?